If you come to this page feeling alone and overwhelmed because members of your family are in conflict over an issue, or several issues, related to the needs, interests and/or plans of a parent or elder relative, take heart. 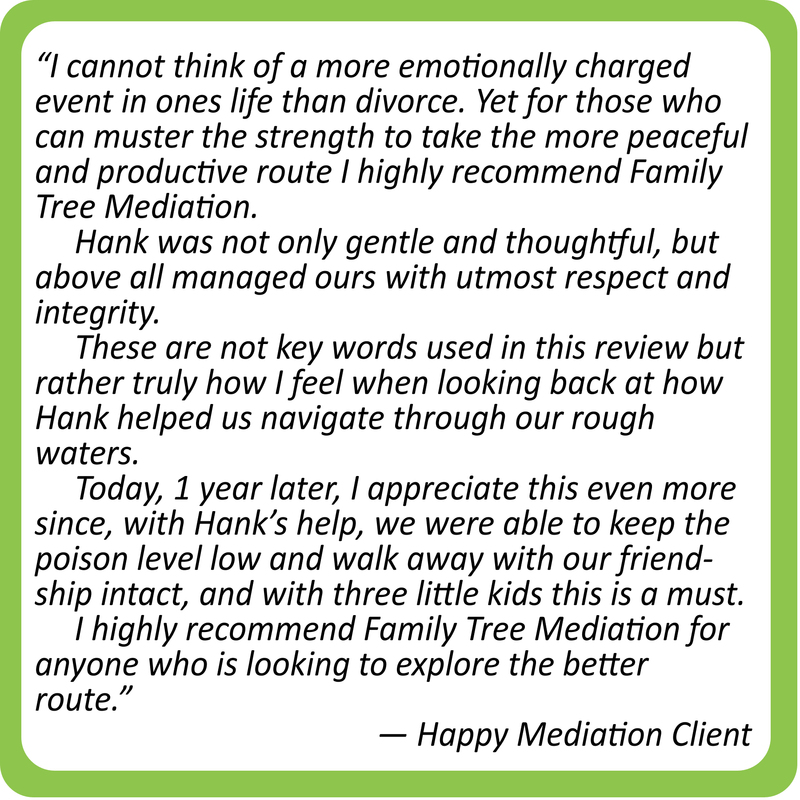 The truth is families everywhere are experiencing an increasing need for assistance in navigating conflict and the good news is that professional mediation is developing increasing capacity to meet that need. Children are now raised in all kinds of family configurations and the traditional vision of the nuclear family no longer pertains in the majority of American households. Young adults take on staggering amounts of debt to fund college. Women are increasingly becoming the major income source for families of all kinds. Siblings are commonly dispersed from coast to coast and even internationally. And the elderly, who live on average thirty years longer than they did a century ago, are able to live longer with chronic diseases requiring various degrees of ongoing care. 43 million Americans — one quarter of all American households — provide unpaid care to adults over 50-years-old. It is a brave new world families face today. We deserve each other’s admiration for getting on as well as we do! 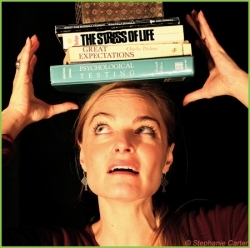 It’s a common joke these days, however, to refer to oneself and one’s family as dysfunctional, but we are not truly dysfunctional; we are simply struggling to cope with a surge of societal changes coming to a head with the aging of the baby boomer generation. So cut yourself and your family members a little slack. It’s no wonder if you are experiencing painful conflict. 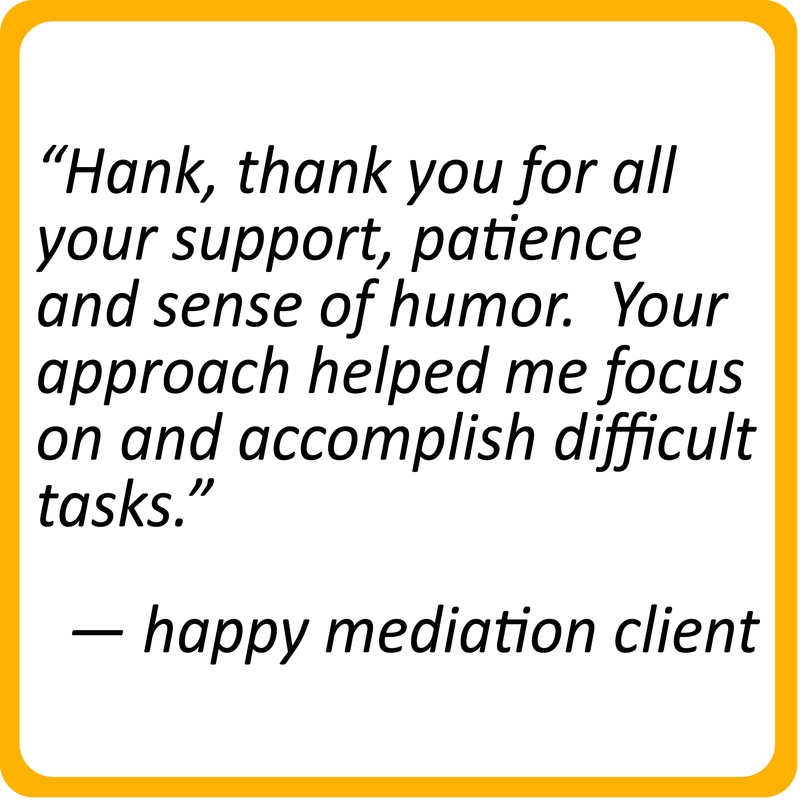 But now consider that elder mediation can offer you and your family a path to real relief. The need to move beyond old relationship patterns and to heal old wounds among siblings and between parents and their adult children. The need to foster a means of discussing the way sibling wealth disparity affects the process of making decisions as a family. 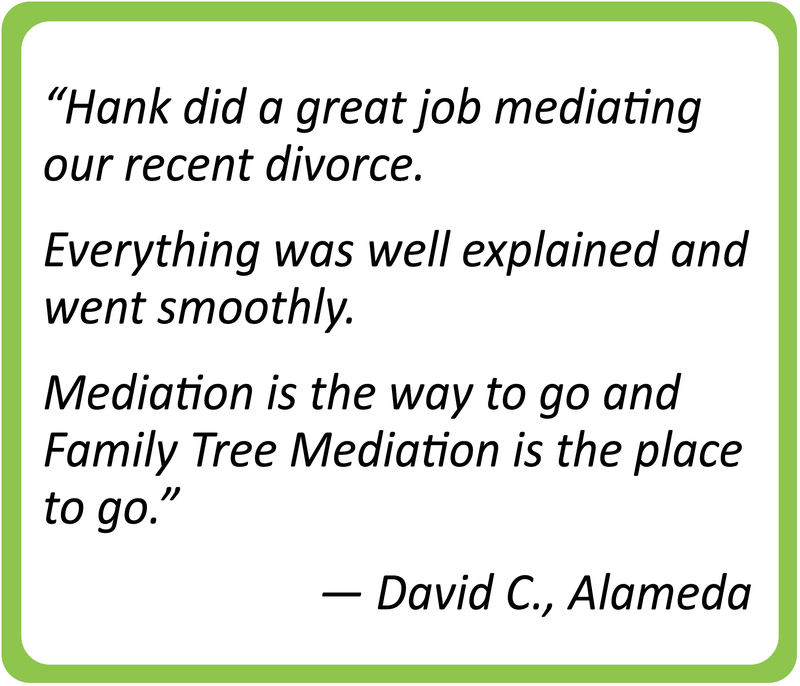 If you have questions you would like to ask about Family Tree Mediation’s elder mediation services or if you would like to schedule an appointment for mediation, you can call me at (650) 762-TREE [762-8733] or email me using the email form on our Contact Us page. One way or another, my wish for you is that help is on the way! 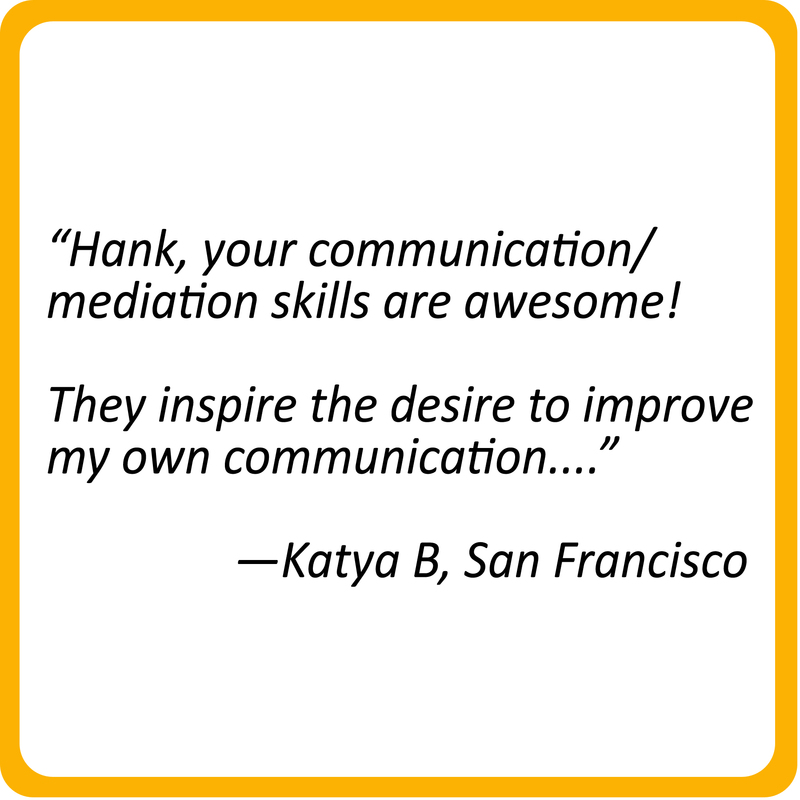 More Durable and Reliable Solutions: Mediation provides a safe and attentive space and process for each side to hear from the other the difficult things that often go unspoken in unmediated negotiations and that often are essential to reaching a wise and durable agreement. Party Control over Process and Outcome: In mediation the parties control whether they reach agreement and what its terms will be. The parties are less likely to support the terms of a court-ordered solution they did not agree to or help craft. Bad Behavior Discouraged: As a collaborative process, mediation discourages bad behaviors common in litigation, such as concealing information, overstating one’s position, and causing the other side needless expense. Empowered by Personal Sense of Fairness: In mediation the parties can make their personal sense of fairness the most important factor determining the terms of their agreement. In court, they are at the mercy of how the judge interpretats the law. 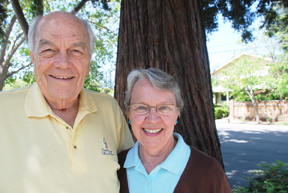 Establishes New Patterns for the Future: The mediator helps participants let go of unconstructive communication patterns in exchange for healthier patterns that can improve the family's ability to handle future problems. Economical, Efficient and More Satisfying: In litigation, one risks increasing animosity in a drawn-out fight costing more in attorney fees than is in dispute. 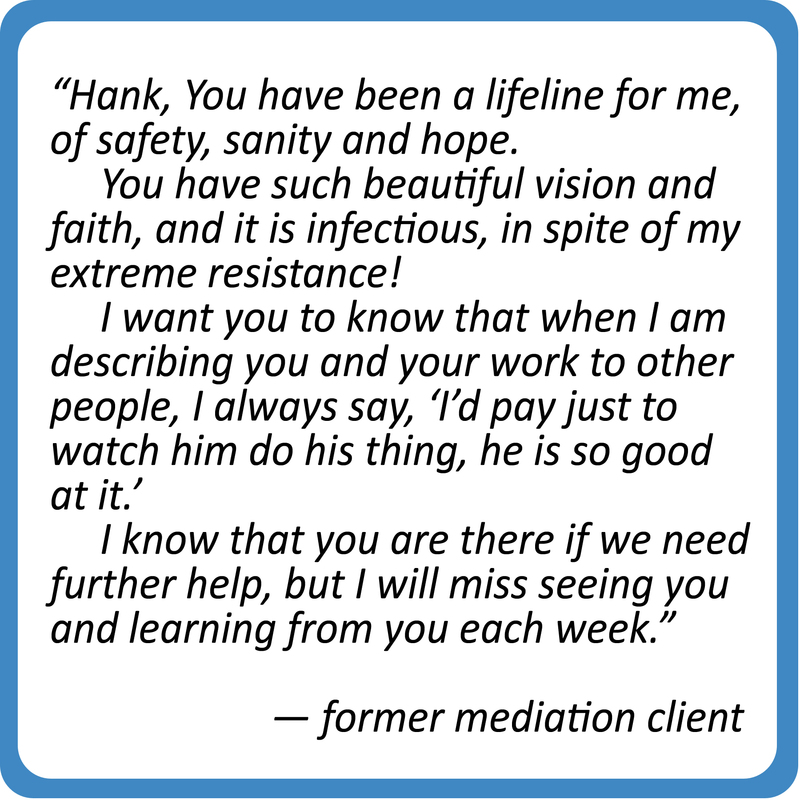 Mediation, by contrast, often achieves mutually agreeable outcomes far more quickly at far less cost while helping heal old wounds. 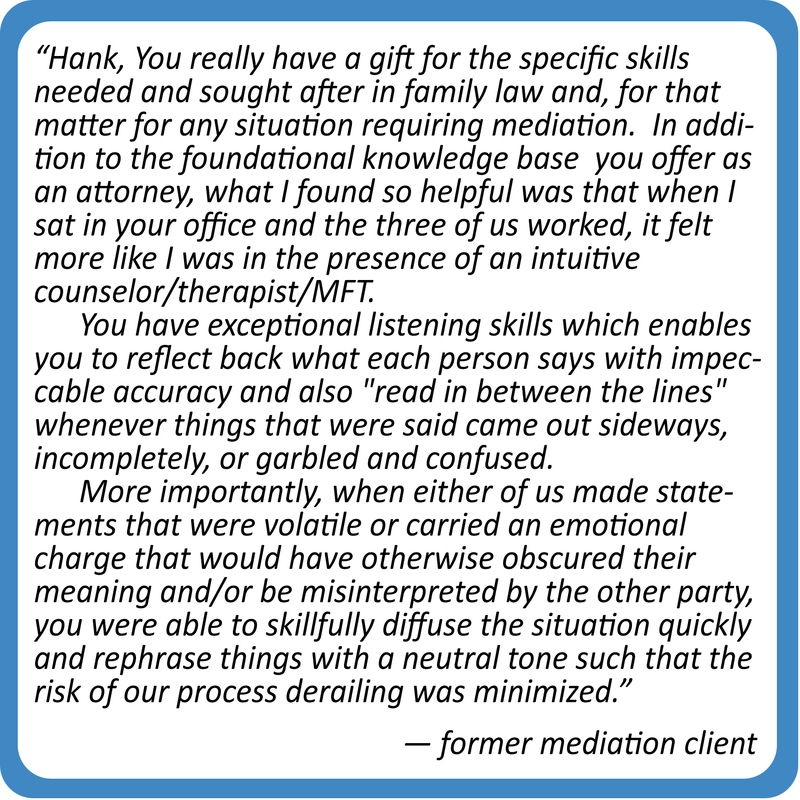 Proactive Opportunities: Mediation may be used proactively to help parties better understand each other and so craft a creative agreement that will serve as a strong foundation for the future of their relationship. It is far better to talk about a conflict now than to live it later.